Trump wants to be the center of attention and he wants to destroy anything that Barack Obama built. 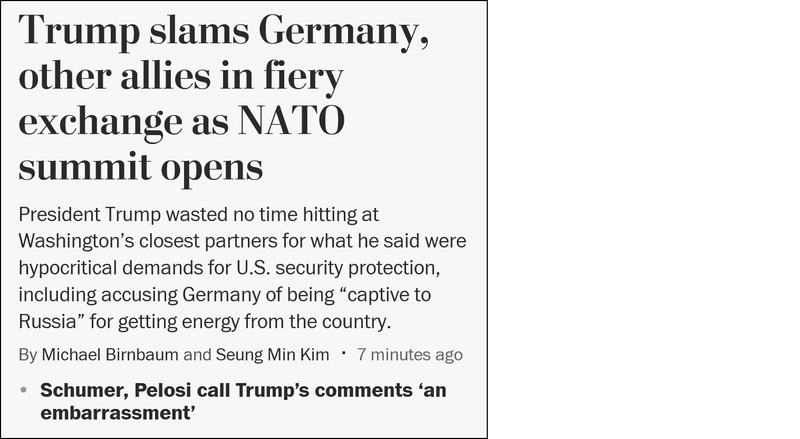 Obama worked hard on the NATO alliance and built a strong relationship with Angela Merkel, so Trump is tearing down NATO and howling about Merkel. There’s nothing more to this, and no one should bother pretending otherwise. Just let him howl and then settle down to business. If Trump theatrically decides not to sign the usual communique at the end of the summit, let him. But whatever anyone does, don’t give him the panic that he wants. Just stare at the ceiling while he rants and then deal with Pompeo and Mattis when it’s all over.